In a small town, you may need several lines of income to survive. So, sometimes, people try to start multiple businesses all at once. That’s a mistake, and to see why, let’s take a look at farming. 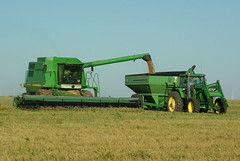 Farmers take their time in adding any new crop. That new crop will take acres away from the existing crops, so it needs to be worth the effort. If the crop requires buying specialized equipment, that has to be factored in. Then there is the learning curve. Any new crop will take some time for the farmer to get a feel for it, to know the potential problems and the issues of timing. It’s a smart lesson. Take your time in adding new lines of business. Let each one get well-established before you move on to adding another one. It will take time away from your existing lines, so it needs to be worth it. If it takes new equipment or training, factor that in. Give yourself time to learn the feel of the new business, to know when it’s vulnerable, when it’s strong. Learn the seasons and cycles of your new business, before you start thinking about adding another one. My Small Town Rules co-author Barry Moltz shared some of this in Rule #3: diversifying your risk. If this makes sense to you, you might like a sample of our book Small Town Rules. New to SmallBizSurvival.com? Take the Guided Tour. Like what you see? Subscribe. Becky started Small Biz Survival in 2006 to share rural business and community building stories and ideas with other small town business people. She and her husband own a retail liquor store in Alva, Oklahoma, and a small cattle ranch nearby. Becky is an international speaker on small business. Wondering what is and is not allowed in the comments? Or how to get a nifty photo beside your name? Use your real name, not a business name. Don't see the comment form? Comments are automatically closed on older posts, but you can send me your comment via this contact form and I'll add it manually for you. Thanks! Glad you dropped in to the rural and small town business blog, established in 2006. We want you to feel at home, so please take our guided tour. Meet our authors on the About page. Have something to say? You can give us a holler on the contact form. If you would like permission to re-use an article you've read here, please make a Reprint Request. Want to search our past articles? Catch up with the latest stories? Browse through the categories? All the good stuff is on the Front Page. Ready to set up a shop local campaign in your small town? You'll need a guide who understands how we're different and what really works: Shop Local Campaigns for Small Towns. What is holding us back? Why does every project take so long in small towns? Why do people say there’s nothing to do here then not come to our concerts?